Lately I have been seeing the work of some really talented photographers who have been shooting 6x6cm square film frames, particularly Cara Rose, whose art I've been following on Flickr. Sadly, most of those photos were taken with Hasselblad equipment. Now, if you're not into photography or cameras I have to explain that the Hasselblad cameras are made in Sweden and are very, very nice and subsequently very, very expensive. Somewhat like the Bentley or Rolls Royce of cameras. Even these days with film's decline the Hasselblad equipment is quite pricey. Since I run this shoestring operation on a budget designed to keep domestic harmony, that's just out of the question. However, something about that square frame is very appealing. 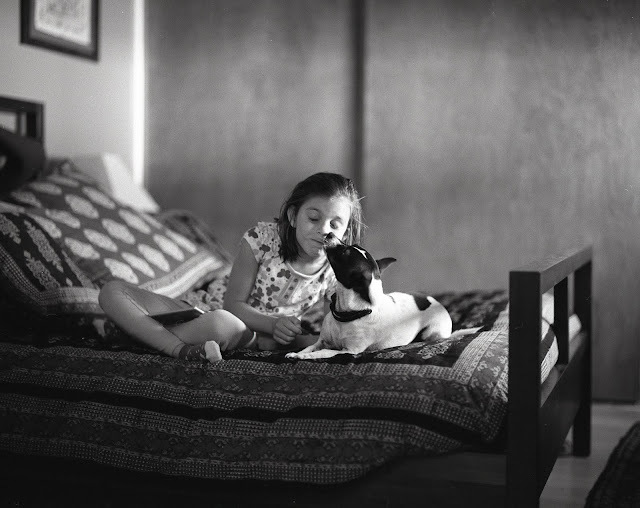 Until recently I had only taken one roll of 6x6 film, that with Joel's Yashicamat. As it happens, I still have ahold of that Yashicamat, and I actually put another roll of film through it just last week, but that isn't my camera and I don't feel quite right continuing to use it. How to satisfy that square frame medium format longing then? I already own a Pentax 6x7 (well, to be honest, three of them... it isn't my fault, they were broken and really cheap...) but as the name implies, that shoots a not quite square negative of 6x7 centimeters. Close, but not quite right. 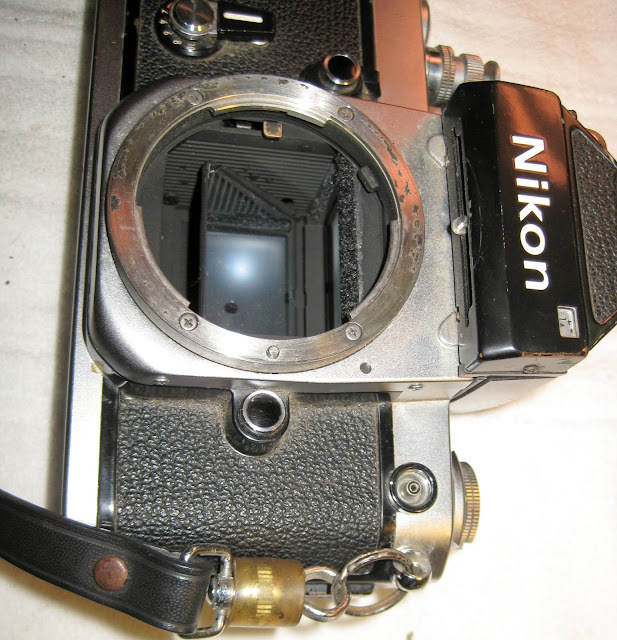 Also, the 6x7 is a hefty camera with even heftier lenses which, while they can take a super nice photo are a bit bulky to sling over the shoulder and walk down the street with (though I've done it). It just so happens that I had some color film to get processed (I don't do color film here in the kitchen) so I went to the local Hooper camera. Nothing real exciting there, but it happens that on the same block are the fine folks at Pro Camera Repair. Wayne, the proprietor, is a really nice fellow who is very tolerant of my occasional visit to peruse his used equipment cabinets and will sometimes let me fondle cameras. In return, I sometimes buy stuff from him. He happened to have a Bronica ETR body in his cabinet and I happily fondled it, but it shoots a 6x4.5cm negative which is also not quite square. 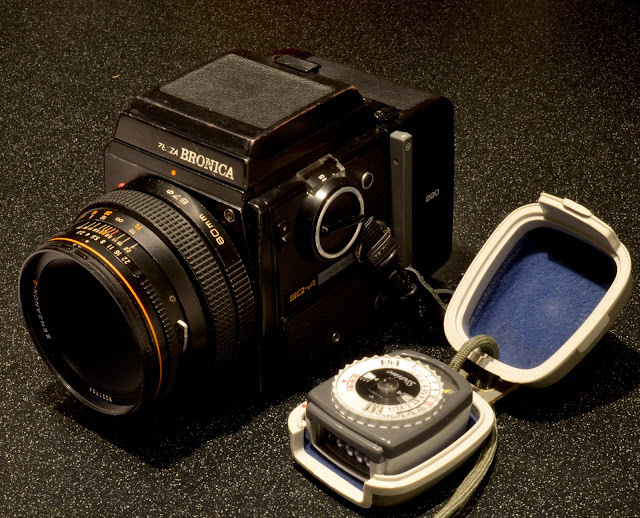 However, that Bronica fondling prompted a tiny bit of research at home which revealed the Bronica SQ, a square frame camera! Where to go, then, to find a Bronica SQ? I checked the EBay, but dang, them Bronicas were pricey. Smacking my forehead I thought, KEH, of course. The fine folks at KEH usually have all kinds of nifty stuff for attractively low prices and they again did not disappoint. I ordered an SQ-A body, 80mm 2.8 lens and a couple of backs, one 6x6 and one 6x4.5. The Bronica people actually set it up so you can take multiple formats with this one camera which is pretty cool. Sadly, KEH's finders were strangely expensive, so I checked the 'Bay and found a waistlevel finder in Japan for a reasonable price. The Bronica has no meter in the body, the meter is in the finder, but the waistlevel is not metered. Fortunately I had the foresight to own a couple of light meters already, so that wasn't going to be a problem. 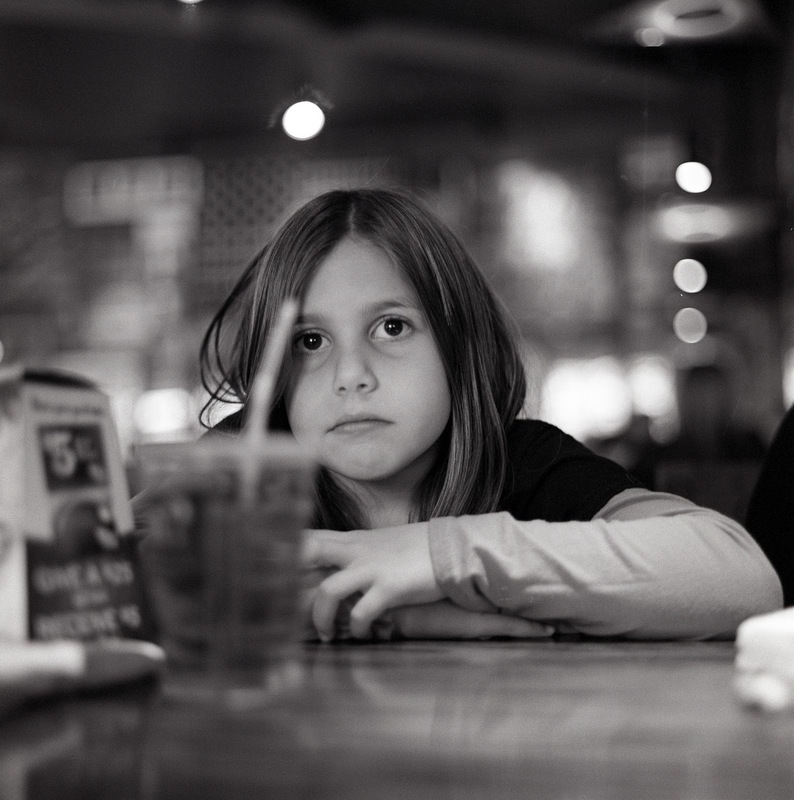 The photo above is of my amazingly tolerant daughter Shea and is from my first roll through the Bronica. I have to admit that I had a little problem at first with the multiple exposure lever and the first two frames of that first roll are a bit psychedelic. I took a few photos before I realized that the lever needed to be turned 90 degrees from where it was if I wanted to advance the film. Since I figured that out, though, not a hitch in the roll. Hopefully I'll be featuring some more square photos here on Only One Eye Open now that the Bronica has joined the herd. John, congrats on the Bronica, I suspect you'll love it. Great shot you have there, and I love Tri-X....I can't recall if I have shot it in 120 yet, but I do have a couple of rolls in my backpack that I didn't get around to loading this past weekend. Hopefully soon! I find this shot particularly interesting for the DOF and your chosen aperture. I've found that with my 150, f/5.6 is as open as I can go and be relatively sure I'll get a good number of keepers. I must get a wider lens, the 150 is all I have!